The price of our cable TV service has increased steadily over the years. Right now, we pay close to $60 a month for "Expanded Basic", which is the lowest option that gives us Disney and Nickelodeon. It's just plain old "analog" cable, which I prefer for a few major reasons: first, there's no extra equipment, I can take a "cable-ready" TV to any room in the house, plug a coax cable between it and the wall, and get all the channels I need; second, there's no extra cost for that extra equipment; third, the service is just plain cheaper. Comcast did let us try out digital cable for three months with no obligation once (with no change in price during our trial even), and although the digital box was neat, especially being able to pause and rewind live TV, it just wasn't going to be worth how little we'd use it. With more and more content available over the internet, and the fact that our kids seem to consistently opt for watching a DVD over the TV, the need for a pipeline of predetermined, commercial-laden programming just isn't there. We can take that $60/month and put it to much more useful purposes. That's two or three new DVDs a month (even more if they're the $5 discs with old cartoons that my boys have enjoyed lately); or a new release video game; or half way to a nice universal remote that runs the TV, DVD player, and the Xbox; or simply $60 that we just don't have to spend. Besides watching DVDs, we also have Netflix (whose basic sub-$10 service, with one-at-a-time disc by mail and unlimited internet streaming, is more than sufficient for our viewing habits). When I hear a rumor of a TV episode I absolutely have to see (such as South Park's "Dancing with Smurfs"), it's on the internet in one form or another. Anything else, we just don't care about. We've never seen Heroes, never rescheduled our week around Lost, never lamented missing an episode of American Idol. And I don't feel bad about it at all. The only thing we might miss is the toddler shows — no Mickey Mouse Clubhouse, Handy Manny, Dora the Explorer, Little Einsteins, or Backyardigans to throw on for the 3-year-old. But then, his attention span never lasted a whole show, anyway, so it's hardly a big loss. The Comcast service rep that I talked to didn't give me a hard time at all when I called to cancel the TV service. He did say there were less expensive TV options, but I told him that I'd rather just completely cancel it, and he didn't give me any more push back. In fact, the process was a lot more smooth than I was expecting. (Thank you, Comcast, for having a friendly and helpful representative on the other end of the line. He suggested an option, then accepted my decision without complaint.) In about a week, we will have officially cut the cord on cable TV. The next step will be shaving a few bucks off the phone bill by moving from Comcast's $45/month VOIP offering to something a little more affordable as well. Ooma looks pretty appealing, although I do wonder about their business plan (can they really survive on "no monthly fees ever"?). Vonage is a possibility as well. There's a story breaking about a boy in the Lower Merion School District of Ardmore, PA who was busted for "improper behavior". What is making this story so exceptional (and frightening) is how, apparently, this behavior was discovered. In this school district, students are issued Macintosh laptops, which, as one might expect, are installed with various lockdowns and security software in place. However, it seems, part of this "security software" includes the ability for the school to remotely activate the laptops' built-in webcam; and the student's "improper behavior" was caught on this camera in his own home. The school has come out and said the camera is only activated in situations when the laptop is considered "stolen", except they have not indicated that this was one of those situations. This seems clearly a case of a school violating students' privacy and grossly overreaching their bounds by policing kids in their own homes. It already has the interest of the FBI, who are investigating the school, which has already backed off on their supposedly-benign security policy. The more that comes out on the story, the worse the school sounds, too. It seems that the "inappropriate behavior" that was "caught" by the webcam was the student eating candy. At home. Busted because the candy "looks like" drugs when viewed over a shot over a surreptitiously-controlled webcam. The software itself, which is analyzed in this Stryde Hax blog post plus a link to a hands-on with an actual Lower Marion laptop on the Save Ardmore Coalition blog, is pretty scary. Besides its constant "phoning home" with location and pictures, there's apparently a lot of insecurities in the way it runs (rather ironic for a supposed "security" program). I can only say that any equipment that my children are issued by our schools (which aren't giving laptops away yet), I will be analyzing closely. Not only will I be monitoring my network, but cameras and microphones will be covered with an adequate supply of electrical tape. Here we are, in Month 16 of capped internet usage (incidentally, Comcast's alleged bandwidth monitor is still absent from my account page). 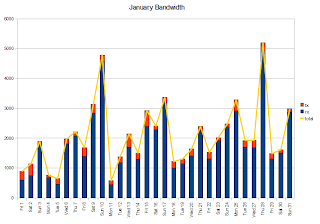 January, apparently, was a heavier use month, although off the top of my head, I'm not sure why. Aside from what looks like a couple of big movie days (although one on a Thursday is unusual — did I download something that day? ), the overall usage seems to have increased a bit. It could have something to do with my getting a new Zune media player and subscribing to several audio and video podcasts. The added bandwidth might be enough to cause an uptick in general activity.